I love raw pasta sauces. They are quick, easy, fresh, and delicious. My favourite is this vibrant green pesto. It feels like I’ve blended a salad and mixed it with pasta. When I eat it, I feel like I’m getting my greens in for the day. I use fusilli because it holds more sauce. This pasta is good hot or cold and great for a packed lunch. In a blender or food processor, combine the walnuts, garlic, jalapeno, salt and pepper. Process until the mixture is smooth. Add the spinach and process until blended. With the machine running, gradually add the olive oil. Bring a large pot of salted water to a boil over high heat. Add the pasta and cook for 8 to 10 minutes. Drain and reserve about 1 cup of the pasta water. 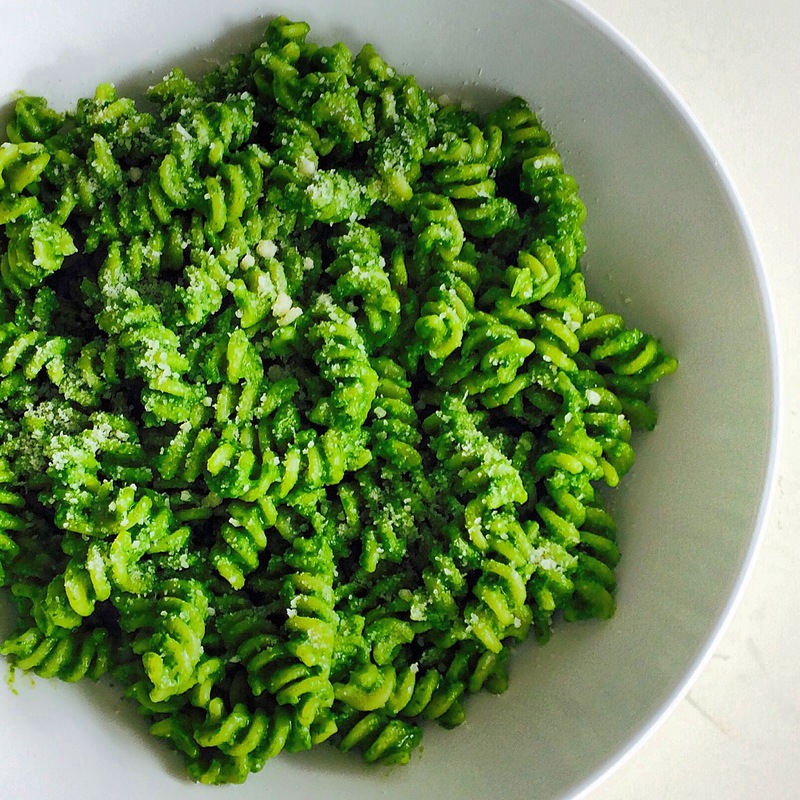 Place the cooked pasta and pesto in a large serving bowl. Toss well and thin out the sauce with a little pasta water, 1 tbsp. at a time. Add parmesan and toss pasta. Finish with a drizzle of olive oil and parmesan cheese. I like this as a vegetarian dish, but some grilled shrimp or prosciutto crisped up in the oven would go well with this pasta.